Penguins belong to the category of flight less birds and are generally found in extreme cold environments. Although there are 20 different types and species of penguins, penguins are generally black and white in color, they are excellent swimmers and have an excess body fat which allows them to live in extreme cold conditions. 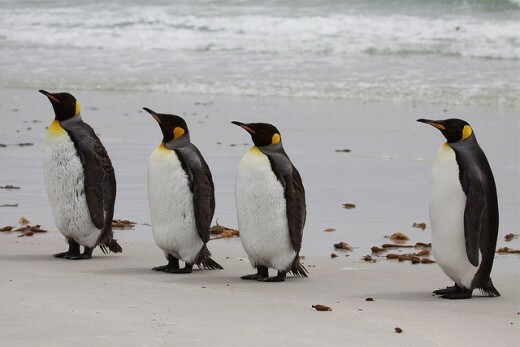 Penguins are also recognized with their distinct walk. Another common feature of all the penguins is that they use their wings for swimming in water and mostly all the penguins feed on fish and krill. There are many types of penguins which apart from sharing their general features mentioned above differ in some aspects. King penguins are commonly found in the Sub Antarctic islands which are located in the northern part of the Antarctic. The king penguins are said to the second largest class of penguins. They are around 90cm tall and on average weigh around 14-16 kg. These penguins are recognized by their bluish outer coats. Their belly like all the penguins is white but their coats turns black around the neck and the head region, a feature which also sets them apart. The male king penguins are generally larger than the female ones. They are fast swimmers and have an average swimming speed of 6.5 km/h. The word Antarctica is taken from the Greek word 'Antarktik' which means opposite to the North. Antarctica is the only continent in the world which doesn't have permanent residents. The Rockhopper penguins are comparatively smaller than the king penguins and are on average 55 cm tall and weigh around 3.35 kg. These penguins are also more common and are found on almost all the islands of the Antarctic. 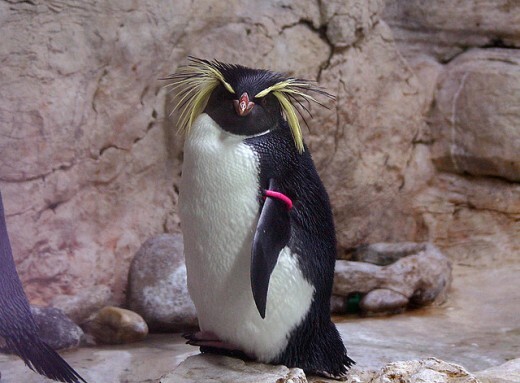 The Rockhopper penguins are recognized by their red beaks, striking red eyes and bright yellow colored eyebrows. They are also famous for their hopping and jumping, hence the name Rockhopper. The nests of these penguins are made of small pebbles and twigs and are found on rocky hills. They feed on mostly small fish, krill or squid. 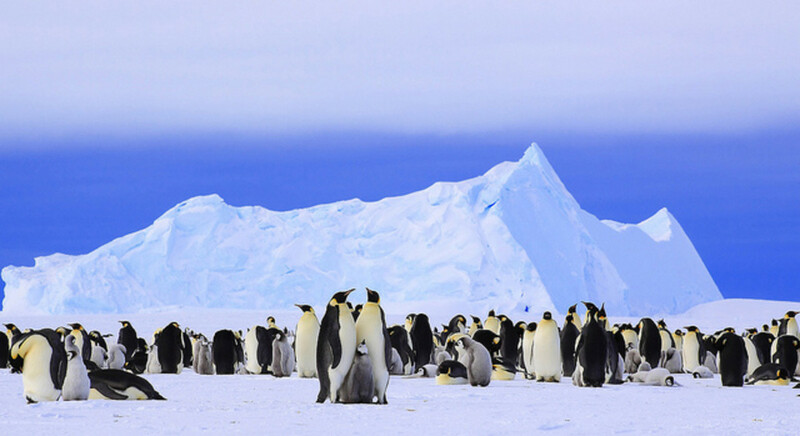 The emperor penguins are the heaviest and the tallest penguins in world. Their average weight is 35 kg and they are almost 100 cm tall. They are fast swimming penguins with an average swimming speed of 9 km/h and are the only penguins which can withstand the most extreme cold. 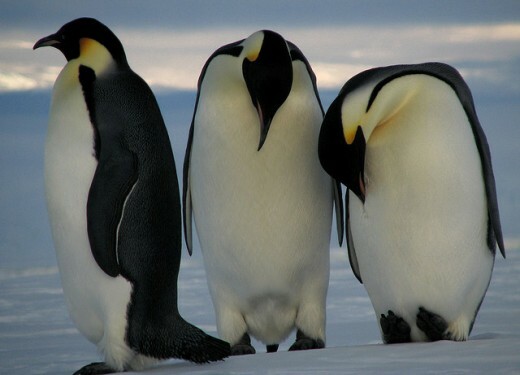 The emperor penguins have a white belly and their neck region is pale yellow. The head of these penguins is covered in black and so is their back. The emperor penguins are also famous for their mating. Every year they cover long distances and travel miles in search for a mating partner. The fairy penguins are very small penguins and perhaps the smallest in the world. 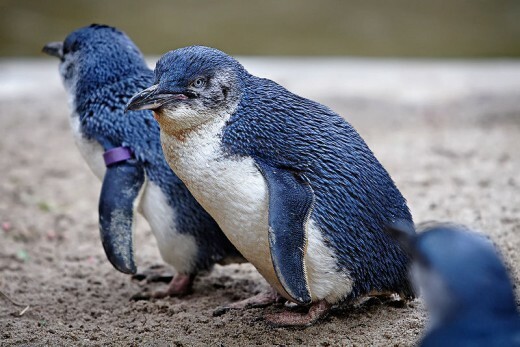 They are mostly found in the coast lines of New Zealand and Australia and are one of the very few penguins which can live in moderate climate. The fairy penguins apart from their miniature size are recognized by their bluish coat. 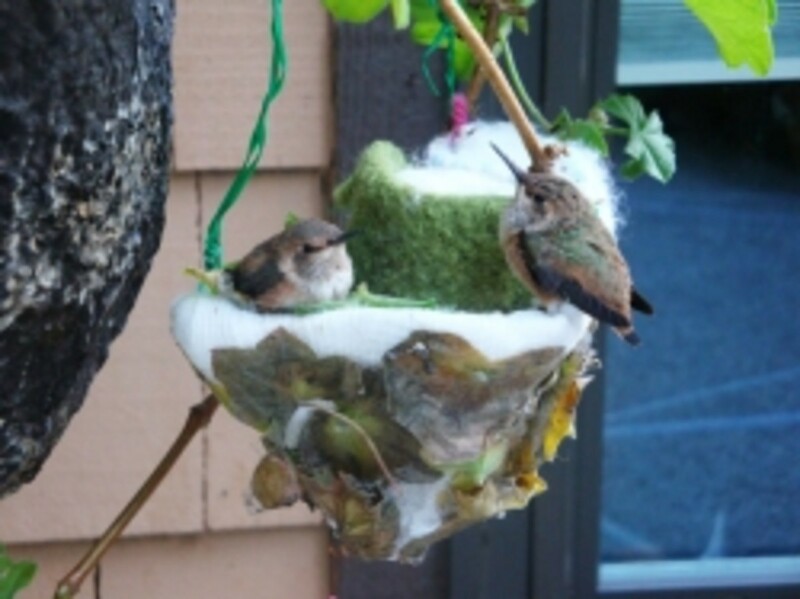 They build their nests under thick plants or holes found in rocks. The effects of global warming are playing havoc everywhere - higher temperatures, hurricanes, heavy rains, flooding and droughts have now become more frequent and severe in intensity. The increase of human population over the centuries has caused not one but many damages to Earth. 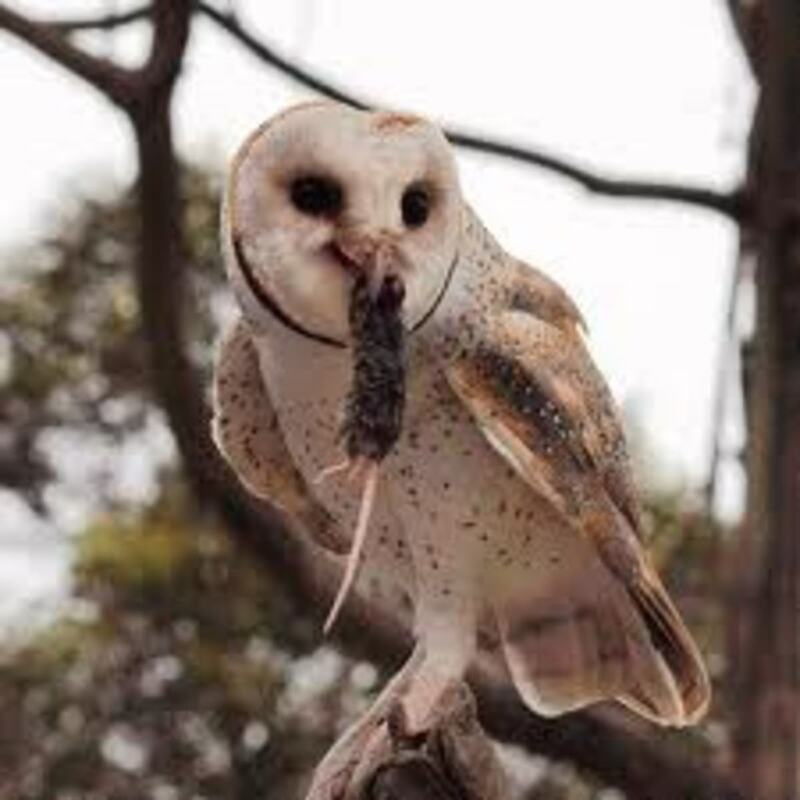 The increase in human population leads directly to the increase in their demands which in turn leads to animal hunting. The Adelie penguins are average sized penguins and are mostly found in all the areas of the Antarctic coast as well as the neighboring islands. 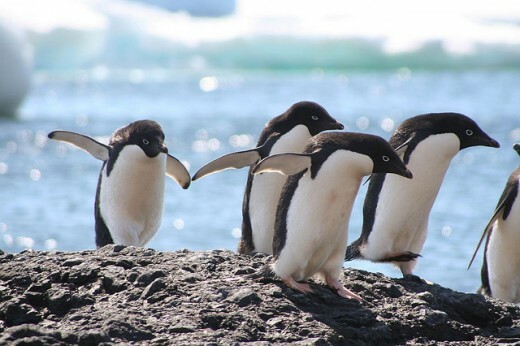 On average they are about 30-50 cm tall and weigh around 4.5 kg.The adelie penguins have long feathers and a red colored bill which is mostly covered by the feathers. The most distinguishing feature of these penguins is the white ring around their eyes. Another unique feature of these penguins is that apart from fish and krill these penguins also feed on snow. The adelie penguins build their nest by piling stones together. The males of adelie penguins look after the eggs laid by the female which is another interesting fact about these penguins. They are very strong and are brilliant swimmers. They can jump easily onto the land from the water. The Gentoo penguins are also mostly found along the northern coast of Antarctic. They are the fastest swimming penguins in the world reaching a speed of up to 36km/h. They have a stiff tail, a red beak and orange feet. On average they are about 32 inches tall and weigh around 10-19 pounds heavy. 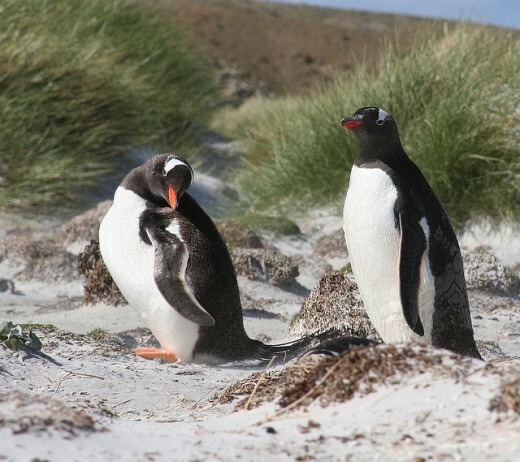 The Gentoo penguins live in colonies and mostly feed on krill and small fish. 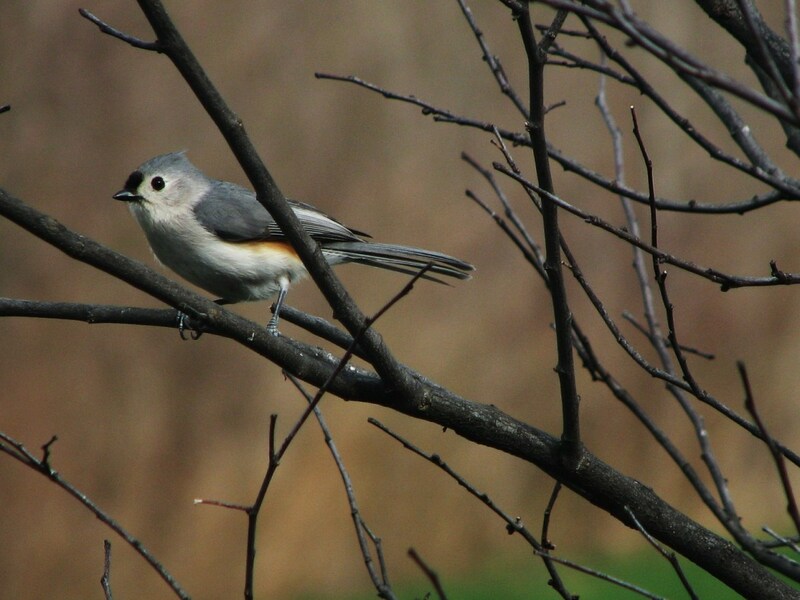 They are also recognized by a patch of white feathers on their head. Water covers 75 per cent of the earth's surface. For every square mile of dry land there are two and a half square miles of ocean surface. Dolphins are aquatic mammals famous for their friendly nature and excellent sense of vision. Below given are some facts about the dolphins. Just noticing that you said both the emporer and the gentoo penguin were the fastest swimmers. The real fastest swimmer is the gentoo penguin.